There was a book review recently in the Korea Times about a couple of authors who had published recently. The review was titled Masters Return With Bitter History and covered a couple of areas of Korean History. What particularly interested me was a photo from World War II that served as an inspiration for Jo JungRae, an author, for his latest book, “Oh God.” The photo shows a Korean soldier in German uniform on a Normandy beach in 1944. The photo itself had been previously featured in “D-Day” by Stephen Ambrose. 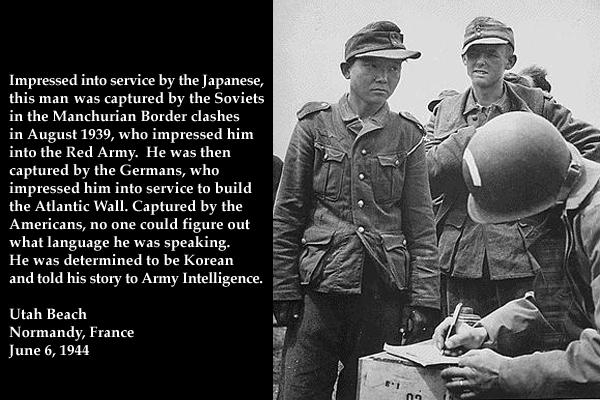 Apparently an American soldier from the war had told Ambrose that he had met four Koreans wearing German uniforms when his unit participated in action against German troops on the beaches of Normandy. It seems that the Koreans had been conscripted into the Japanese Army but after being captured by the Russians at the Battle of Nomonhan in the Russo-Japanese War (part II, the 1940’s one, not the 1904-05 one). They were pressed into service in the Russian Army. Captured by the Germans in a battle near Moscow, the Koreans were then pressed into service in the Wehrmacht. They were then captured by the Americans whilst they were engaged working on the Atlantic Wall. The Americans (mercifully) did not press them into service but rather held them as prisoners of war. It seems that these poor souls never made it back home to Korea as apparently the Koreans were exchanged with the Soviets for American POWs liberated by the Red Army. This I find a little suspicious as at that time the Red Army and the US Army were on the same side and no POW exchanges should have been necessary. I could accept that they were returned to the Soviet’s however as at that time there was a largish Korean Diaspora under Soviet control and they therefore would have seemed like a Soviet problem to deal with. The picture itself can be viewed at the WW2 Multimedia Database == World War II Multimedia Database, WW2 Talk the homepage of the Database being here at http://www.worldwar2database.com/. The book itself is written in Korean so I cannot read into it, however, the idea behind the book was appealing, doubly so as I have been doing some research into the Battle of Nomonhan anyway. I will post an article about that later when I get the research finished. I don’t know if this has been mentioned before, but I recently found a film on Netflix about this subject. The film is titled “My Way”. It is not a documentary, but a great war movie. Check it out. My Way is a Korean movie released earlier this year, IIRC, that was loosely based on the incident described by the photo. I think its a valid story. I watched the movie my way.on netflix. 10/10 best movie I ever watched. It’s tragic how many people die in war. Because we exchanged prisoners we freed for the ones the Soviets freed. Actually, repatriated is a better term rather than exchange, we sent theirs home and they sent ours home. Thanks John. I was hoping it was something like that but the description I had read used the term “prisoner exchange” which is kind of misleading. There is also a good deal of mist around this story too. Some reports have at least one of these guys living in the USA post World War 2, others that they never made it back to Korea (ending up in the Korean diaspora in Kazakhstan in Soviet times is a possibility). I must devote some more research time to this. Judging by the number of hits this post gets (even discounting the ones as a result of the Reddit reference), it is a subject that has tweaked people’s interest, helped along by the movie last year. It is also the post here that has drawn the most vitriolic comments. If your nationality was Korean that time you were considered “unreliable” (Because of threat of japanese spies) and could not join army. Although they sent him to the “Labour army” which was basically a Gulag. He was lucky he met a guy from there, he told him that lots of people die there. So my grandfather decided to burn all his documents including passpords.and abandon all conections with his family . Because of war there was a lot of refugees he made up story that he is mongolian and a refugee from nazi occupied territories. Ironicaly after the war he was guarding japanese prisoners from Kwantung army he kept secret about this story untill the fall of Soviet Union.